Happy Heist Day: The Cutest but Least Convenient Bat/Cat fight ever. There are days when it’s ten kinds of awesome having a fully-characterized, three-dimensional, complex and nuanced Batman characters in your head. Then there are days like this, when I’m sipping morning coffee—innocently sipping morning coffee—and happen to hear that it’s the 25th Anniversary of the Gardner Museum heist. I ignore this for a while, thinking it warrants no more than a link on the Cat-Tales facebook page, reminding readers how Selina taunted Bruce with information about the famous robbery in order to get him to come to bed in The Gotham Rogues, and a short while later, the FBI did in fact report a break in the case, anticipating recovery the art. Ha! That was my plan… but then inner Selina starts campaigning to make it Heist Day, an international Cat Burglar Holiday, and I should call for everyone to wish her a happy one and post pictures, etc. etc. After all, half a billion dollars worth of art taken including three Rembrandts, a Vermeer, a Manet and sketches by Degas, THAT’s an anniversary the community celebrates. Then Inner Bruce pipes up, reminding me that the heist inspired Senator Edward Kennedy to make the stealing of major art works from a museum a federal crime, increasing the statute of limitations to 20 years. Hardly something for criminals to take pleasure in, but a giant step forward for law enforcement. The two of them have been bickering about it ever since, and it would be adorable except I’m trying to get stuff done. Don’t blame me when The Neighborhood: Chapter 4 is late. Blame them. Posted in cat-tales | Tagged bruce and selina, catwoman, gardner museum heist, selina kyle | Comments Off on Happy Heist Day: The Cutest but Least Convenient Bat/Cat fight ever. ‘Got a match?’ Matches Malone inhaled, his eyes lingering just long enough on a delicately suntanned ankle to be tempted upward… The Femme Fatale has arrived in The Neighborhood- Chapter 2: Sitrep. On the Cat-Tales website and mobile-friendly mirror Cat-Tales.mobi. Something about a borrowed dress shirt, gets the job done every time. Posted in cat-tales | Tagged batcave, batman, bruce and selina | Comments Off on Coming to bed? I’m often asked what I would do differently if I was starting Cat-Tales today. I tell them honestly: Not much, but the big difference is that James Gordon would be police commissioner. Cat-Tales began when he had resigned after being shot in the ill-conceived Officer Down storyline, an event that was instrumental to getting that Runaway Snowball of WTFTM rolling that sparked A Girl’s Gotta Protect Her Reputation in the first place. It was right for the time. It was right for the Catwoman story being told, and it was right for the meta commentary on DC Comics that is the series’s raison d’etre. But it’s not quite right for an ongoing Batman series. For years, I’ve planted my flag on the principle that stories have certain elements that are not negotiable, and where Batman is concerned Jim Gordon is one of them. That’s his chair. The man who had served as police commissioner since Jim Gordon retired wanted Batman to know he was being vetted for a Presidential Appointment to the Department of Justice… In all probability, Gotham would have a new police commissioner by the end of the year. From the beginning, Commissioner Muskelli was established as a political animal. The change was easy to set in motion, and with so much drama in that tale, I trusted that the significance would be missed, or if noticed it would be quickly forgotten. Things have developed slowly, through Wayne Rises and Inside an Enigma. Now, at last, in the new story that begins today, Jim Gordon is back on the job. Jim Gordon is back. 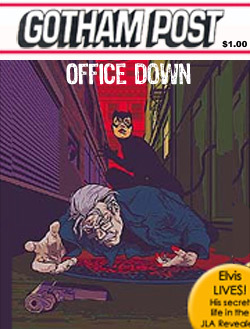 When he resigned, Catwoman was an anonymous cat burglar. Now she’s Selina Kyle, living with Bruce Wayne, and running this company that’s messing with Ra’s al Ghul. There might be a learning curve. “Goodnight, Kitten” a sweet Bruce & Selina companion piece to “Morning, Handsome” both by Remidar in the Cat-Tales Gallery. Selina has been living in Wayne Manor since Highland Games at the top of Book 3. There are a number of bedroom scenes since then. Chris chose one from Go Rin No Sho to illustrate the touching intimacy of the moment captured in this beautiful illustration by Remidar. Please suggest some other ways to bring the tales to the attention to those people who love Batman, love Catwoman, love Bruce and Selina as a couple, but aren’t getting what they want from the comics, games and movies.